The purpose of the first module is to review all the principles learned in the first year, as well as learning a few new ones. See how everything can be integrated into one coherent chart analysis routine. Module 201 will build on the approach introduced in Level I, Module 106, adding the use of nakshatras and vargas and demonstrating through a number of chart interpretations how everything can work together. Week One will discuss basic principles for chart rectification. -Terms and Concepts. Week Two will also review the basic principles for assessing the effects of dashs/bhutki. Week Three will study the impact of the gochara of the grahas, and synthesize the various predictive techniques into a coherent interpretation. Module 202 will discuss each principle in the context of a chart by showing how an event was indicated. Module 203 continues with advanced forecasting, discussing Ashtakavarga, and Varshaphal in greater details. It will teach how to; calculate an ashtakavarga chart, interpret and use a binnashtakavarga of a planet, to locate the kakshya ruled by a graha in a sign and use it in analysis, and to use the sarva ashtakavarga totals in chart analysis. This Module continues to examine in greater detail some elements touched on in Level One. It will focus on the Panchanga. A natural application of the Panchanga is Muhurta, the astrology of selecting an appropriate time for an activity. Module 205 explains what Prashna is and how it works, fundamentally, describes the criteria for determining a valid Prashna questions, states the basic principles for conducting a successful Prashna reading, and demonstrates the ability to interpret a Prashna chart. In Module 205: will find that the course material is presented using a combination with the Discussion Board, William Levacy’s book “Beneath a Vedic Sun”, and included charts and articles. This Module will outline and discuss the historical origins of Ayurveda. It will demonstrate an understanding of the Vedic philosophical background, integrated with Ayurvedic principles of healing as they relate to Jyotish. It will teach an understanding of the principles and practices of interpreting a Vedic astrology chart as related to physical, mental, and emotional health and Ayurvedic body types or dishes. It will demonstrate how to write clearly and convincingly about the issues presented to you in classroom discussions and assignments centered on Vedic Astrology and health. This Module demonstrates how to analyze and compare two Vedic natal charts to determine if the relationship between those charts and the possibility of a successful relationship is excellent, satisfactory, marginal, or unsatisfactory. This Part 1 of 2 course is designed as the first stage in the culmination, integration, and display of your advanced learning of Vedic astrology principles and practice. Example charts will be given to test your overall mastery of the process of comprehensive interpretation of a Vedic astrology horoscope. 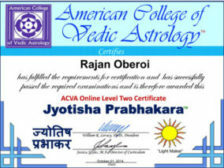 This Part 2 of 2 course is designed as the second and final stage in the culmination, integration, and display of your advanced learning of Vedic astrology principles and practice. Example charts will be given to test your overall mastery of the process of comprehensive interpretation of a Vedic astrology horoscope.